The island female team experienced a tough game against Belize High School of Agriculture. Both teams proved to have a strong defense that neither team could break through, but a penalty kick in favor of SPHS team allowed Normalee Gomez to score the goal of the match. With this win, the island football squad advanced to the championship game against Corozal Community College (CCC). Both teams played in a defensive mode, with a few futile attempts at the goal. During the second half of the game, CCC made several attempts to break through SPHS’s barrier, with little success. The island girls faced the same resistance every time they approached their opponent’s goal as well. In the last minute, however, before the long whistle blew, SPHS’ Gomez came to the rescue and scored the only goal of the game. The 1-0 final score gave San Pedro girls the regional championship for a third consecutive time, and Gomez won the award for the Most Valuable Player. The male SPHS team could not fight for a spot at Nationals after they were defeated by CCC 3-2. They had to settle for third place at the end of the competition. Coach Elshaddai Bent told The San Pedro Sun that he is very proud of the female team. He also commended the male team for their great effort. Bent stated that they would continue working hard as they aim to bring home the National Title as they did in 2017. The San Pedro Sun congratulates both teams for representing La Isla Bonita at the Northern Regionals once again. 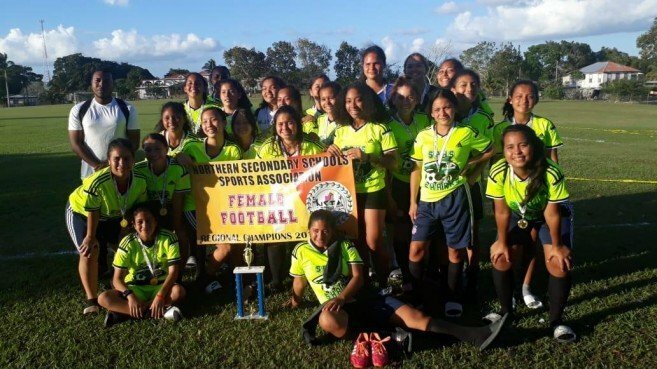 We wish all the best to the SPHS girls in the National Tournament.